And if Obama is fortunate enough to win on Tuesday, his victory will be a victory for all those people too. Don’t get me wrong – ending slavery and ensuring the vote ain’t small potatoes. It’s not like their historical actions would otherwise have been in vain. 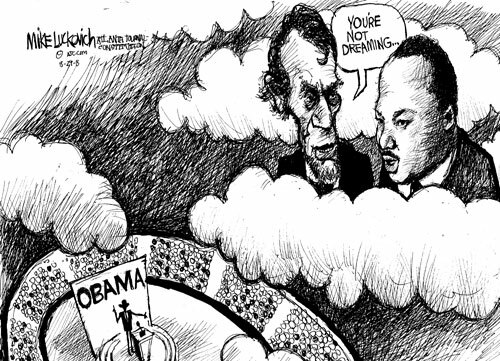 But Obama – as talented as he is – comes on the shoulders of these past giants. His presidency is possible because people for the past 200 years believed in holding America to its standards. And in pursuit of that goal, they were willing to fight, and get beaten, and get lynched for the sake of basic equality – an equality we today have the luxury of taking for granted. And that’s what’s so exciting about a potential Obama inauguration speech. You can literally imagine the area being filled not just with overflowing crowds, but with teary-eyed ghosts too. Generations of them, from Frederick Douglass to Thurgood Marshall to nameless farmers to voting rights activists. It’s a powerful moment – particularly considering the magnitude of the historical obstacles it faced. Not in vain, those dead.